Description: A Fresh Anointing. His words seemed to fasten like arrows in the souls of men. They cut like a sword. Like the power of a hammer, they broke down strongholds. Multitudes experienced this power. Often, just a look or a single sentence would bring conviction and result in an almost immediate conversion to Christ. 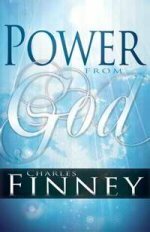 This was the life and ministry of Charles Finney, the life of a Christian filled with power from on high. God promises to pour out His Spirit and power on us. Open your heart to God and receive a fresh anointing that will transform your life, your community, and the world. Walk in the power of God! Click here to save money on this book as part of a specially priced Ultimate package.